For more videos, pictures and testimonials. In the world of athletics, speed rules! 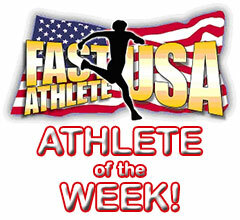 Fast Athlete USA offers sport specific training protocols using high-speed isokinetic equipment. Our unique methods focus on the development of fast-twitch muscle fibers, which are the basis of all quick dynamic movement. Our programs are designed for elite athletes and those who want to be. We offer training packages for professional, youth and college athletes alike. Whether you are a professional looking to maintain your competitive edge either in or off-season, a middle-school teen trying out for your track team or anywhere in between, we can help you achieve your goal.